The Lucerne pattern was designed in the early 1960s and glazed in a light brown coffee brown and powder blue. Stunning Teacup and Saucer set by Langley/Denby Pottery. The Canterbury pattern was designed by Gill Pemberton and Glyn Colledge in 1969. Coloured a tan/ light brown, both interior and exterior. Also features a striking but subtle horizontal ribbed pattern. 3 DENBY LANGLEY. "SHERWOOD". SALAD PLATES. Salt and Pepper Pots, Lidded Mustard Pot with Matching Ceramic Stand. A GREEN DENBY LANGLEY. "SHERWOOD". ALTHOUGH THE PHOTOS LOOK BROWN THEY ARE INFACT AN OLIVE GREEN COLOUR. NO EXCEPTIONS. Denby Gypsy pink cup and saucer. V good condition. Saucer diameter is 15 cm, 6 inch. Cup diameter is 8.5 cm, 3.5 inch and is 6.5 cm, 2.5 inch high. Cup capacity is about 180 ml. Overall weight is 434 gram. Cotswold pattern was designed in 1973, and this little teacup has a textured main body, with a matt glazed rim and saucer. Both pieces have Denby backstamp. A DENBY LANGLEY. "SHERWOOD". SOUP BOWL WITH UNDER PLATE. They have a pattern of a flower in shades of brown and olive green, on a beige background. Weight: 700 g.
Denby Gypsy Pink Cup and Saucer. Excellent Condition. John lewis small white ceramic sauce jugs. Dispatched with Royal Mail 2nd Class. Denby Extra Large Storage Jar - Country Cusine Pattern – 1980’s – Retro Kitchen. o The Country Cusine Pattern – Manufactured by Denby Pottery 1980's. Clarissa Hulse Boston Ivy cereal bowls Metalic Pattern x 4 Brand New. O The collection is traditionally shaped, glazed in dark brown with a blue gloss interior. Denby regency green small shallow bowl Set of 4. Fabulous Speckled Blue Beaker in Sia Style Colour and Design, no sticker or mark. In excellent condition, a small chip on outer lip, otherwise no cracks or crazing. Height 4.25" , diameter at top 3.25" and at base 2.25" . B16.Reasonable offers considered. I am happy to combine postage if you find something else you wish to purchase. "Denby Mug". Maker : Denby. Item : Mug. 8.5 cm across the top. ​Condition Report : It is in excellent condition. I can find no faults. Get images that. Age : Late 20C. 23cm across. We are Platemates, the china matching agency for discontinued china. A GREEN DENBY LANGLEY. "SHERWOOD". COFFEE POT. ALTHOUGH THE PHOTOS LOOK BROWN THEY ARE INFACT AN OLIVE GREEN COLOUR. Denby Pottery Small Casserole Dish - Bakewell Denby Pattern – 1980s – Retro Kitchen. The Bakewell Pattern – Manufactured by Denby Pottery 1980-1987. Capacity – 2 Pints. Weight- 1.3kg. Vintage Denby Daybreak Oval Pie/Serving Dish from Mid 1980’s Excellent Condition. Dispatched with Royal Mail 2nd Class. Glyn Ware Plate. White plate, hand decorated with colours of green, orange and grey. 1950-1975 common backstamp present. Denby 10 cm diameter curved handle bowl with green lid. Ovenproof dish that is also signed by A. College. There is a 2.5 cm chip on the inside of the lid hence the bargain price. Cotswold pattern was designed in 1973 and is white with brown leaves and flowers. Stoneware made in Denby England. We are here to help! Handcrafted using pottery skills passed down through generations. Denby Studio craft birch nesting bowl Set of 4. A "Sherwood" teapot and tall jug by Langley Pottery (later known as Denby). They're made of chunky brown stoneware with a light tan along the horizontal ridges. These are heavy and built to last, they also retain heat very well. GREEN DENBY LANGLEY. "SHERWOOD". ALTHOUGH THE PHOTOS LOOK BROWN THEY ARE INFACT AN OLIVE GREEN COLOUR. Denby Pottery Baking Dish – Souffle Dish - Bakewell Pattern – 1980’s – Retro Kitchen. o The Bakewell Pattern – Manufactured by Denby Pottery 1980-1987. o The collection is traditionally shaped, glazed in dark brown and hand-painted with a bold ochre flower and stylised leaf sprays. Denby Teacup - Seville Pattern – 1970’s – Retro Kitchen. o The Seville Pattern – Manufactured by Denby Pottery from 1975. o The collection is traditionally shaped, glazed in a lovely light tan brown colour. Denby Studio craft chesnut nesting bowl Set of 4. 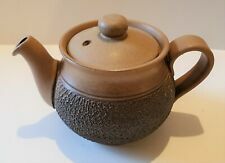 Original Bourne Denby jug with great acorn handle to the lid. Lovely charming lidded jug. Great country kitchen style jug. A lovely coffee pot manufactured by Denby in the Arabesque pattern. Denby Teacup - Bakewell Pattern – 1980’s – Retro Kitchen. o The Bakewell Pattern – Manufactured by Denby Pottery 1980-1987. o It’s okay to change your mind! 6 x Saucers. 1 x Milk pot. 1 x Sugar Pot. 1 x Tea pot. 6 DENBY LANGLEY. "SHERWOOD". DINNER PLATES.